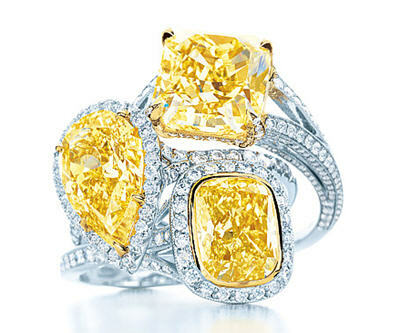 Tiffany yellow diamond rings with white diamonds and platinum and 18 karat gold settings (clockwise from top): rectangular modified brilliant fancy intense yellow diamond ($425,000 US), pear-shaped fancy intense yellow diamond ($150,000 US), cushion-cut fancy intense yellow diamond ($145,000 US). Long-term trends for the diamond retail market look good, said Oliver Chen, a senior retail stock analyst for US-based Citigroup Investment Research in an interview with Bloomberg TV (video below). Chen said 80% of US brides-to-be wear diamonds and for those getting married a second time it’s about 60%. In China, about 30% of brides wear diamonds. Global demand is increasing, he said. China is an increasingly important market owing to its growing middle class and makes it No. 2 in the world after the US. The world retail diamond market is worth about $160 billion total, with the US spending $60 billion and China $30 billion. The market is relatively competitive in engagement rings, Chen said. For example, Tiffany & Co. (NYSE: TIF) has good margins at about 20%. The luxury market is more insulated as wealthy buyers can still afford to purchase goods. Although Citigroup gives it a neutral rating at the moment, Chen said he likes retailer Signet Jewelers Ltd. (NYSE: SIG) over the longer term. It's the the No. 1 market share leader, has different treated brands — Kay Jewelers, Jared, H. Samuel, Ernest Jones — and can afford to run huge $100-million marketing campaigns. Another company that looks good is Zale Corp (NYSE: ZLC), which offers the designer Vera Wang collection as well as a coloured diamond collection. Gemstones of different hues are a nice trend and opportunity. The fashion/jewellery intersection is good for business because a diamond may be bought every season. Dominion Diamond (TSX: DDC; NYSE: DDC) is another stock Chen likes because it's one of the only pure play ways to buy a publicly traded company. Chen also noted that it takes about 10 years to find a mine and extract from it, and there are very few mines coming online. There's about a 3% to 4% growth rate in mines versus 10% growth of demand. Additionally, there is a lot of scarcity since diamond stockpiles have been worked through at DeBeers.